Properties in Cloppenburg District average 4.7 out of 5 stars. Property 4: Apartment centrally located in the city center. Property 12: ..schön that you stop by! Apartment-Loga, with everything your heart desires. Property 16: Apartment-Loga, with everything your heart desires. Apartment for two - small but nice! Property 24: Apartment for two - small but nice! 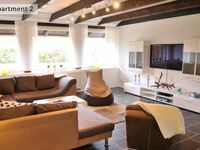 Property 32: Feel good in East Friesland! Enjoy the peace in an old Gulf farm! A beautiful 1 bedroom apartment overlooking the green in peace, quiet! Property 35: A beautiful 1 bedroom apartment overlooking the green in peace, quiet! Highly recommend this place as the location is central, pedestrian area is walkable distance. the place itself is very cute, thoughtful decorated and has everything you need. Even though it is in the heart of Oldenburg, it is very quiet. Petra was always quick to respond to any questions that arose. The bathroom is a bit &quot;cozy&quot;, but everything is clean and nice. I will certainly come back.